Aiming to improve the operation and productivity of the overall railway operation, the Components and Spare Parts Tracking System helps facilitate item locating and status updating automatically and accurately on a real time basis. Time and efforts wasted in existing manual recording and management of the large number of components and spare parts is greatly reduced. 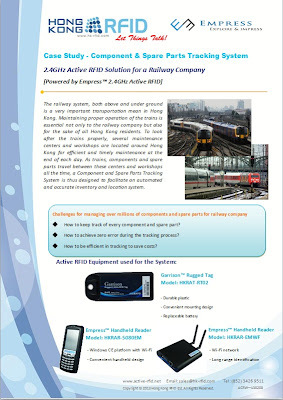 Efficient components and spare parts management and railway operation can be ensured. The tracking system involves a web-based application which can be accessed using a PC through network. By attaching active RFID tags onto the components/spare parts and installing active readers in different maintenance centers/workshops, location and item status could be tracked automatically. Such information would be sent back to and synchronized with the system’s server when network is available. With the implementation of the system, the latest location information of components and spare parts could be obtained effortlessly. One can retrieve data and generate reports for management and monitoring purposes at any time required. Efforts and time used for updating and tracking of components and spare parts throughout the year could be saved. Operation efficiency and productivity is thus enhanced and guaranteed.